St. Justin was one of those glorious saints that have illustrated the Church of Christ by their extraordinary learning, as well as by their eminent virtues. He wrote in defence of Catholic truth against pagans, Jews, and heretics, and presented to the emperors and Roman senate two famous "Apologies," wherein he vindicates the innocence of the Christians, and proves that the crimes imputed to them were mere calumnies of the pagans. By the sanctity of his life, and the zeal and energy of his preaching, he converted many infidels, and finally terminated his brilliant career by a glorious martyrdom. St. Justin was born about the beginning of the second century at Neapolis, the capital of Samaria, of Greek parents, who were idolaters. Having gone through the usual elementary course of studies, he found himself inspired with a great desire to know something concerning the Great Cause, or Creator of all. Having in vain sought for truth among the Stoics, Peripatetics, Pythagoreans, and those of the Platonic school, God was pleased to satisfy his yearnings after a wonderful manner. Having wandered one day into a solitary place in order that he might with more quietude enjoy his meditations, he met with an old man of very venerable appearance, who told him that if he wished to arrive at the knowledge of the true God, he should leave the study of philosophy, and begin to read the Prophets, who in their writings had manifested to man the mysteries of God, and announced Jesus Christ His Son, through whom alone we can arrive at the knowledge of the true God. "But," continued this venerable personage, "above all things, pray to the Lord to illuminate thy mind; because these things are not to be understood except by those unto whom God hath given the knowledge of them." Having pronounced these words, he disappeared. After this interview, Justin applied himself continually to the reading of the Holy Scriptures, from which he derived that blessed knowledge which made him embrace the faith and receive the sacrament of regeneration about the year 133, being then about thirty years of age. The constancy and fortitude of the martyrs, in suffering tortures, and laying down their lives for Jesus Christ, as he himself confesses, contributed much to his conversion, from which time he dedicated himself entirely to the love of Jesus Christ, and the advancement of his religion. To this end he received the holy order of priesthood, and exerted himself continually in the conversion of infidels and heretics, as considering himself called by God to the defence of His Church. Hence he used to say: "Since I have obtained from God the grace to understand the Scriptures, I labor to make them understood by others also, lest my neglect should be punished at the tribunal of God." And again: "I am determined to manifest the truth, although I should be cut to pieces." Having proceeded to Rome, he instructed many in the doctrines of the Christian faith; and there about the year 150 composed and presented to the Emperor Antoninus Pius, and to the Roman senate, his first "Apology," wherein he demonstrates the truth of the doctrines, and the sanctity of life, which the Christians professed. He adds, that many of them had lived in a state of inviolate purity for sixty or seventy years; and that Christians are so enamoured of this angelic virtue, that they either live in perpetual continency, or embrace the married state for the holy purpose of training children in the love and service of God; their desires being placed in the joys of eternal life, which they expect through the death of Jesus Christ. In testimony of the truth of the Christian faith, he brings forward the fulfilment of the prophecies, which had been preserved by the Jews, the avowed enemies of the Christians. "We have seen," says the saint, "those prophecies fulfilled in our own days, by the birth of Jesus Christ from a virgin; by His preaching and miracles; by His Passion, resurrection, and ascension into heaven; by the reprobation of the Jews and the destruction of Jerusalem; by the conversion of the Gentiles, and the establishment of the Church throughout the entire world! These prophecies, so perfectly fulfilled, must convince us that Jesus Christ is truly the Son of God, who shall come one day to judge mankind, as hath been foretold, and as we believe." The Church in those days kept concealed from the uninitiated the celebration of the most holy mysteries; but St. Justin thought it necessary to explain them, in order to contradict the infamous calumnies of secret lewdness and infanticide, which were being circulated against the Christians. Wherefore having explained the sacred ceremonies of baptism, he proceeds to speak of the Eucharist in the following terms: "He that presides in the assembly is presented with bread and a chalice of wine, with water; whereupon, in the name of the Son and the Holy Ghost, he renders glory to the Father. And by these gifts doth he make thanksgiving, which all the faithful confirm by the word 'Amen.' The prayers, praises, and thanksgiving being terminated, the deacons take of the bread and the wine, mixed with water, over which all these holy prayers have been recited, and having distributed them among those present, they carry some to the absent also (The deacons of the ancient Chrurch frequently carried the Eucharist to the Christians who were in prison for the faith). This food is by us called Eucharist; of which no one can partake who believeth not our doctrines, and who hath not been cleansed from sin in the laver of regeneration. This is not common food or drink; but as Jesus Christ our Saviour was, for our redemption, by virtue of the divine word, composed of flesh and blood; so we are aware that, by virtue of the prayer containing His divine words, the food by which we are nourished is the flesh and blood of the Word Incarnate." Thus we see that the present doctrine of the Catholic Church is that which was believed and practised in the apostolic times, in which our saint flourished. St. Justin proceeds to describe the meetings of the faithful: "Upon the first day of the week, a general meeting takes place, when, as time permits, the prophecies, and writings of the apostles, are read. The reading being terminated by the Lector, he who presides makes an exhortation, to excite the people to the imitation of worthy actions. We then all rise, and place ourselves in prayer, which being finished, bread and wine with water are prepared, over which the bishop or priest recites the prayers and thanksgiving, the people answer Amen; and, finally, the distribution of the holy gifts is made by the deacons. The richer sort make a liberal collection, which by the president is distributed to widows and orphans, to the sick and those in prison, to pilgrims or other persons in need. The reason why we meet on Sunday is, because it was the day upon which God began' the creation of the world; and upon which Jesus Christ arose from the dead." It is believed that, although this "Apology" of St. Justin did not cause the persecution to cease, it made a favorable impression on the Emperor Antoninus Pius, as is inferred from his letter, written to the cities of Asia Minor, in favor of the Christians, and recorded by Eusebius. Our saint composed other works in defence of Catholic doctrine, against the Marcionites and Valentinians; and also his Dialogue with Trypho, against the pertinacity of the Jews. Marcus Aurelius having succeeded Antoninus Pius in the empire, the persecution was renewed; and one Crescens, who, although styling himself a Cynic philosopher, was in reality a very shallow fellow, took occasion to exclaim loudly against the Christians. 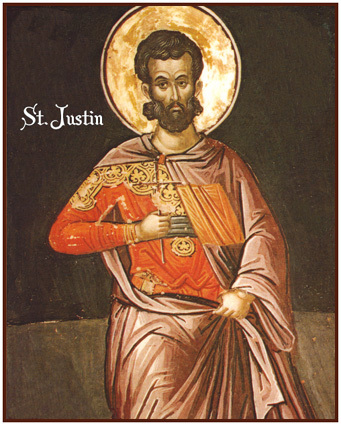 St. Justin, in public dispute, frequently convicted him of the most violent malice, and the greatest possible ignorance of the doctrine and practices of the Christians, and was induced to publish, and present to the emperor, his second "Apology," in which he defends his religion against the calumnies of Crescens and others. In showing that Christians had been unjustly put to death, he relates that a married couple had both been guilty of incontinency; the woman, having been converted to the Christian religion, used all her endeavors to withdraw her husband from his shameful practices; but he, instead of amending, accused her and one Ptolemy, who had been the means of her conversion, of being Christians. The prefect, Urbicus, sentenced them to death; whereupon a certain Christian, named Lucius, exclaimed: "With what conscience, O Urbicus! dost thou condemn a man who hath been guilty of no crime?'' Lucius, together with another Christian, received a similar sentence. A very short time after the publication of this discourse St. Justin was apprehended, together with six other Christians of his acquaintance and brought before Rusticus, the Prefect of Rome, who exhorted him to obey the imperial edicts. The saint replied: "No one can be reproved or condemned for obeying the precepts of our Saviour, Jesus Christ." The prefect asked him what kind of learning he professed. Justin answered that he had learned the doctrines of various sects, and had finally embraced Christianity, although it was despised by those who were led away by errors and false opinions. "Unhappy wretch!" exclaimed the prefect, "dost thou then delight in this discipline?" Justin: "Yes, because it teaches me the true doctrine." Rusticus: "Which is this doctrine?" Justin: "The true doctrine which we profess is, to believe in one only God, the Creator of all things, visible and invisible, and to confess Jesus Christ, the Son of God, the foretold by the Prophets, the preacher of salvation unto men, and the Master of those who happily observe the divine precepts. But neither have I a tongue to express nor a mind to conceive anything worthy of His infinite dignity;--to do so, I would need the mind and the spirit of the prophets, who, inspired by God, foretold His coming." The prefect asked him where the Christians were in the habit of assembling. Justin replied: "Where they please, and where they can. Dost thou imagine, perchance, that we all assemble in the same place? The God of the Christians is not confined to a place; He is invisible, and fills both heaven and earth; and is everywhere adored and praised by the faithful." "But I wish to know," rejoined Rusticus, "where thou and thy disciples assemble." The saint answered: "As for myself, I dwell at the Timothean baths: this is the second time I have come to Rome, and I am scarcely acquainted with any other place in the city; if any one should wish to seek me, I am ready to communicate to him the doctrines of truth." Rusticus: "Thou art then a Christian?" Justin: "So it is: I am a Christian." The prefect then turned to St. Justin's companions, and interrogated them, one after the other, concerning their faith. They all confessed themselves Christians, and manifested a desire to die for Jesus Christ. Rusticus then said to Justin: "Tell me, thou who dost believe that thou hast the true wisdom, whether thou art persuaded that thou shalt ascend into heaven, after I shall have caused thee to be scourged and beheaded." The saint replied: "If I shall suffer these punishments, I hope to receive the reward which is prepared for those who observe the commandments of Christ." The prefect asked: "Dost thou, then, really imagine that thou shalt ascend into heaven;" "This I do not only imagine, but I know it," replied the saint, "and am so fully assured of it, that I entertain no doubt whatever." Finally, the prefect, turning to all those confessors of Jesus Christ, said to them: "Go ye together, and unanimously sacrifice to the gods." Justin, answering for all, replied: "No man in his senses could abandon religion to become a participator in impiety." The prefect hereupon threatened that their non-compliance would be followed by the most unrelenting tortures. Justin said: "There is nothing which we more earnestly desire than to endure torments for the love of our Lord Jesus Christ, and thus attain unto salvation; for this it is that will enable us to present ourselves with confidence at the tribunal of that Judge before whom all the world must necessarily appear." To this the other martyrs assented, adding: "Do quickly what thou art about. We are Christians, and will never sacrifice to idols." The prefect then pronounced against them the following sentence: "Those who have not wished to sacrifice to the gods, nor obey the edict of the emperor, shall first be scourged, and afterwards beheaded, in pursuance of the law." The martyrs were forthwith led to the place of execution, where the sentence being carried into effect, they received the glorious crown of martyrdom, in the year 167, or the following. Their bodies were privately carried away by the Christians, who gave them honorable interment. The Acts of these martyrs are found in Ruinart and Tillemont. There is nothing covered that shall not be revealed; and hid, that shall not be known. It is as though he would say: It is comfort enough for you, if I, your Master and Lord, am a partaker in your reproach. But if it grieve you unto this present to hear these things, bethink you likewise that it is but a little while, and ye shall be free from that reproach. For what is it that grieveth you? is it that they call you tricksters and deceivers? Wait but a little while and all men shall call you the preservers and benefactors of the world. In a little while all the things which are dark now shall be made clear, and the falsehood of them that reproach you and your own goodness shall be shewn in the light. For when that which cometh to pass shall itself shew that ye are preservers and benefactors, and filled with all goodness, men will regard not the words of your gainsayers but the truth. They that now speak evil of you will be found out in the slanderers, liars, and calumniators, and ye shall be seen to be brighter than the sun; time shall make you known and shall preach you with a voice louder than the voice of a trumpet, and shall bring forward all men as the witnesses of your goodness. Let not, therefore, those things which are now spoken cast you down, but rather let the hope of the good things which are to come lift you up. For the things which regard you cannot be hidden. And when he had freed them from pain, fear, and care, and set them above the reproaches of men, he spake unto them in due season concerning the freedom of preaching: What I tell you in darkness, that speak ye in light; and ye hear in the ear, that preach ye upon the house-tops. It was not darkness when he uttered those words, neither was he speaking into their ear. These words were a figure; he was speaking to them alone and in a little corner of Palestine, and therefore he saith In darkness and In the ear, as comparing this manner of speech with that boldness of speaking wherewith he was afterwards to inspire them. Preach, he saith, not in one nor two nor three cities, but throughout the whole world: go over the earth and the sea, the land that is dwelt in and the land that is not dwelt in; speak all things with great boldness to kings and to peoples, to philosophers and to rhetoricians; therefore without any subtlety, but with all freedom, he saith, What I tell you in darkness, that speak ye in light; and what ye hear in the ear, that preach ye upon the house-tops.